The globalization we have been facing in the last decades brought about an equalization of products and services all over the world. In fact, nowadays, the ancient culture, tradition and knowledge play a more and more secondary role in our lives. In what concerns the wine the overall scenery is similar. New countries up surged as wine producers without ancestral traditions and knowledge on the subject but with brilliant market strategies allowing for tailor made productions in line with the consumer preferences, thus conquering relevant market shares. By good fortune there are regions that succeeded in preserving untouched the ancient and traditional practices of conducting vineyards and winemaking. It is recognized that along the Medieval Age the wine growing faced a great development in line with the deep religiosity of those days, the wine being regularly used in the liturgical practices. The Cistercian Order, founded in 1098 in Borgonha, taking advantage of its authority and organizational capacity, played a determinant role in the simultaneous promotion of the Christian faith, western civilization and land valuation. This Order settles down down in Portugal, first in Tarouca, in 1144, a year after the Zamora Treaty establishing the independence of the Condado Potucalense from the kingdom of Leão. As the conquest of new territory was progressing towards the south, pushing the heretic people coming from the north of Africa back to Africa, the need to obtain additional fertile soils from the wild forests was also increasing. With this purpose, our first king D. Afonso Henriques (1109-1185) celebrated several agreements with, among others, the Cistercian monks, giving them, to cultivate, part of the land they succeeded in conquering from the wild forests. This is the reason why the Cistercian monks are also known as the farmer monks. Though its precise localization is still unknown, the Cistercian monks settled down at the end of the XII century, in the Monastery of Tomareis, in the region of Ourém, between the villages of Olival and Urqueira. This monastery was more than a simple farm; in fact its territory was a hunting reserve and a hostelry was also in place. It is easy to admit that such an ensemble must have had a great impact in terms of the economic development of the region, including the viticultural activity. 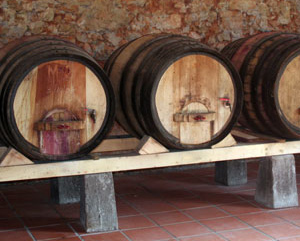 In line with their influence in the region, these “white” Cistercian monks must have taught to the local farmers their method for producing wine. It is against this background that, still nowadays, and despite the eight centuries that have passed since then, the Ourém wine producers are currently producing the wine in their small and characteristic wine cellars according to ancestral practices, thus keeping the tradition.